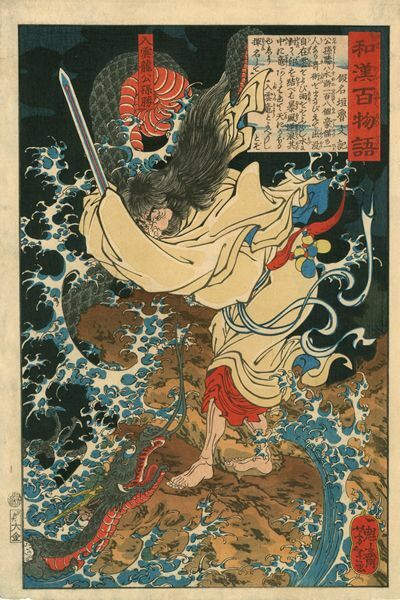 Tsukioka Yoshitoshi (1839-1892)- The Ghost of Wicked Genta Yoshihira Attacking Namba Jiro at Nunobiki Waterfall (Nunobiki no taki Akugenta Yoshihira no rei Namba Jiro o utsu). From the series Shingata sanjurokkaisen (New Forms of Thirty-six Ghosts). 1889. Oban. Keyes 509-9, Stevenson 19. Fine impression with two colour cartouche and wood-grain. Fine colour and condition. 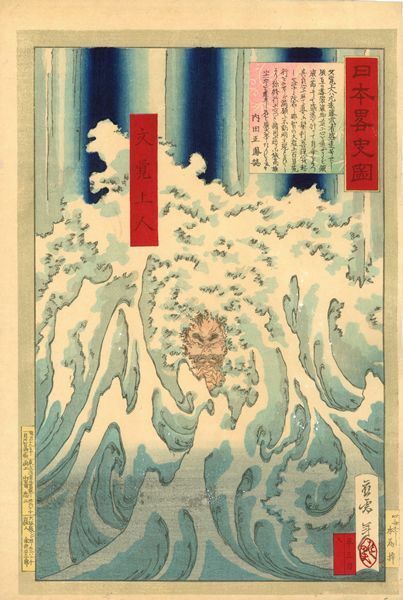 Tsukioka Yoshitoshi (1839-1892)- Ii no Hayata Killing a Nue at the Imperial Palace (Dairi ni Ii no Hayata nue o sazu zu). From the series Shingata sanjurokkaisen (New Forms of Thirty-six Ghosts).1889. Keyes 509-21, Stevenson 10. Fine impression with two colour cartouche and wood-grain. Fine colour and condition. 1879. Oban. Fine impression with splashed gofun. Fine colour and condition. 1860. Oban. 37.3 x 25.7 cm. Robinson S 93-4, fig. 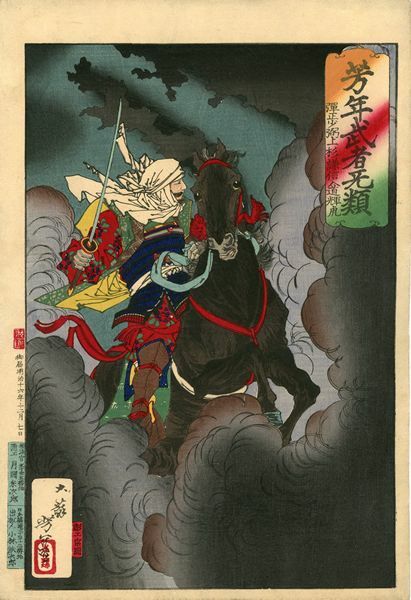 29; Suzuki (1992) 212; Schaap, Heroes and Ghosts, plate 104. Fine impression with splashed gofun. Restored wormhole. Otherwise, fine condition. Untrimmed impressions of this very dramatic design are rare. 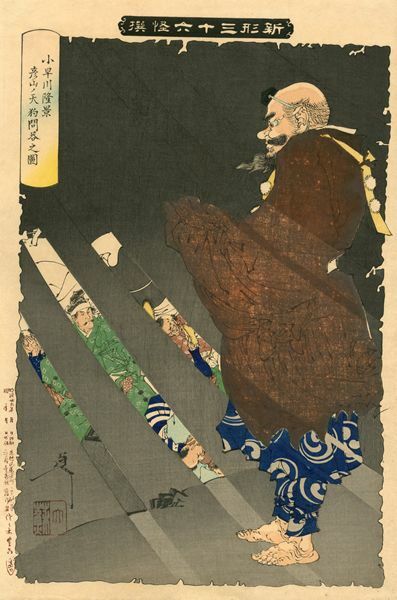 Tsukioka Yoshitoshi (1839-1892)- Danjo Matsunaga Hisahide Preparing to Commit Suicide. 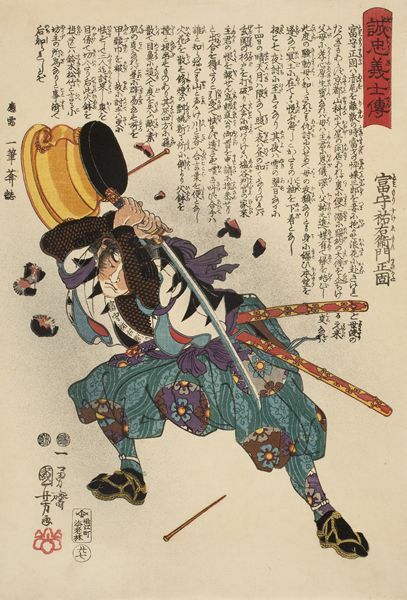 From the series Yoshitoshi mushaburui (Yoshitoshi’s Courageous Warriors). 1886. Oban. Keyes 460-4. Very good impression with large margins. Fine colour. Paper fibre in top margin, otherwise fine condition. 1886. Oban. 37.2 x 26 cm. KKM, 1990, no. 185. Fine impression with extensive splashed gofun for the snow. Fine colour. Very good condition. 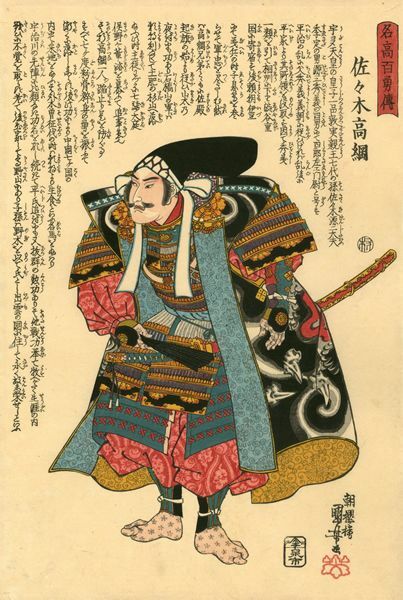 From the series Seichu gishi den (Biographies of Loyal and Righteous Samurai). 1847. Oban. 37.6 x 25.6cm. Robinson S54-27, Weinberg, no. 127, Heroes & Ghosts, no. 67, Clark, Kuniyoshi, no. 44. Fine impression, colour and condition. 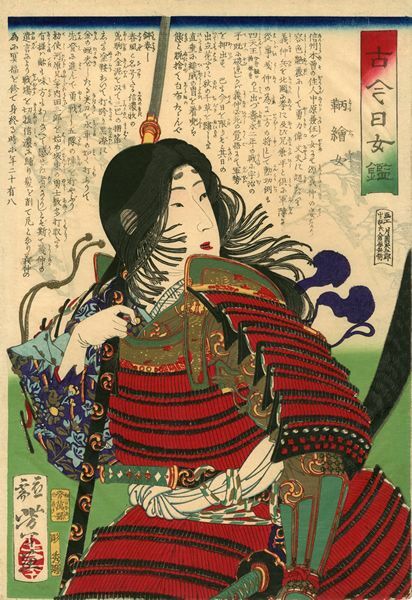 Tsukioka Yoshitoshi (1839-1892)- Tomoe in Armour. From the series Kokon hime kagami (A Mirror of Beauties of the Past and Present). Circa 1875. Oban. Keyes 331-2. Fine impression with burnishing. Fine colour and condition. 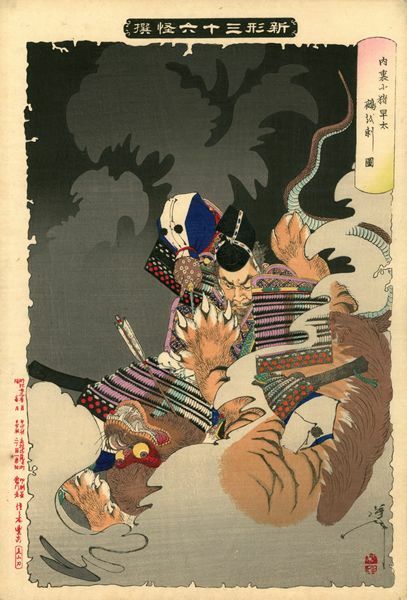 Tsukioka Yoshitoshi (1839-1892)- Ii no Hayata Killing a Nue at the Imperial Palace. From the series Shingata sanjurokkaisen (New Forms of Thirty-six Ghosts). 1890. Oban. Keyes 509-21, Stevenson 10. Fine impression with two colour cartouche. Fine colour and condition. 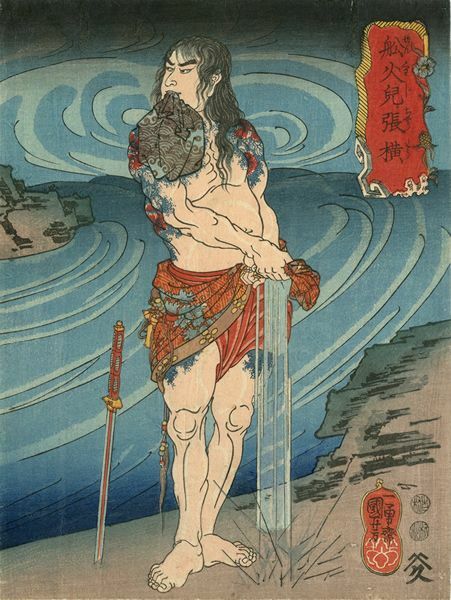 Ichiyusai Kuniyoshi (1797-1861)- Senkwaji Cho-o, Half-naked and Tattoed on a River Bank, Wringing Out His Loincloth. From the series Tsuzoku Suikoden goketsu hyakuhachi-nin (The Hundred and Eight Heroes of the Popular Suikoden). Circa 1845-53. Chuban. Robinson S47-20. Fine impression, colour and condition. Provenance: Masao Takashima. 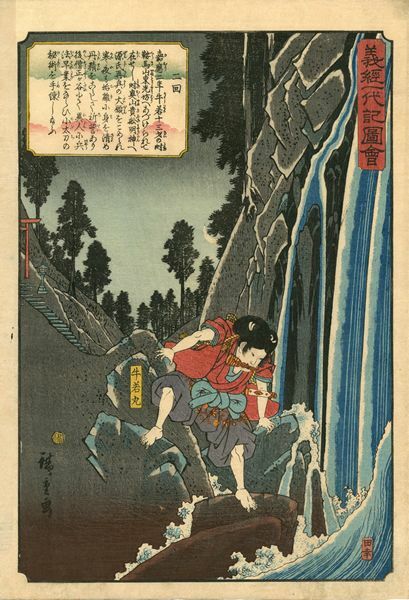 Utagawa Hiroshige (1797-1858)- Ushiwakamura on Rocks Near a Waterfall. 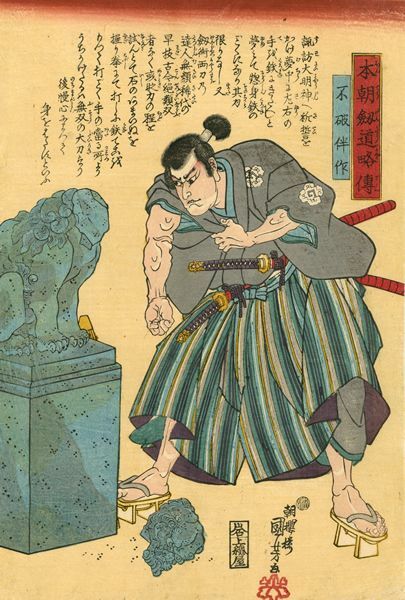 From the series Yoshitsune ichidaiki (Life of Yoshitsune). Mid 1840. Oban. Fine impression. Very good colour and condition. Rare. Tsukioka Yoshitoshi (1839-1892)- Uesugi Kenshin Nyudo Terutora Riding into Battle. 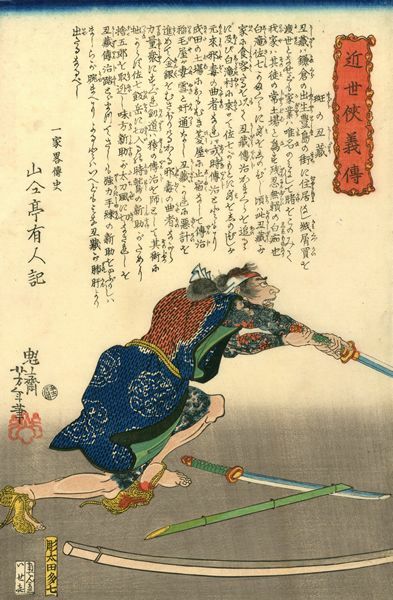 From the series Yoshitoshi Mushaburui (Yoshitoshi’s Courageous Warriors). 1886. Oban. Keyes 460-1. Fine, early impression. Fine colour and condition. 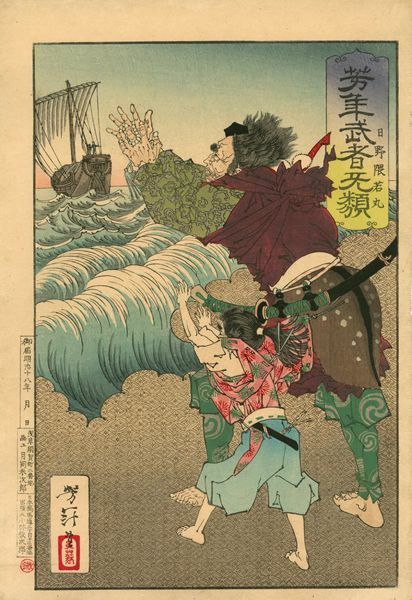 Kawanabe Kyosai (1831-1889)- Repelling of the Mongol Pirate Ships (Moko zokusen Taiji no zu). 1863. Oban triptych. 36.3 x 76.5 cm. KKM (1991) 2. Fine impression with splashed gofun for the waves. Fine colour. Very good condition. For an interesting discussion of this print see Tim Clark, Kyosai: Demon of Paintings, British Museum, London, 1993, page 117. 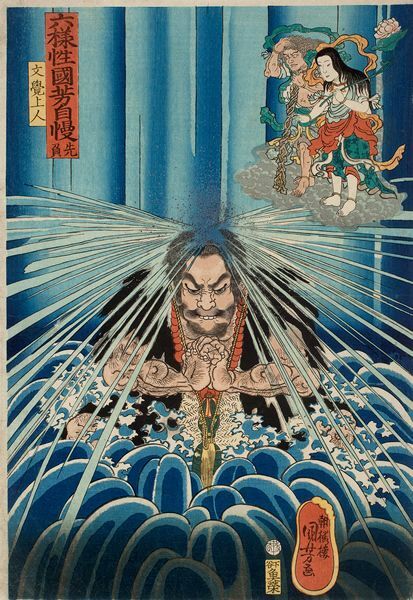 Ichiyusai Kuniyoshi (1797-1861)- Mitono Kotaro Tamehisa and Kazama Hachiro Masakuni Shining Dark Lanterns Upwards. From the series Oguri juyushi no ichinin (The Ten Brave Retainers of Oguri, One by One). Ca. 1843. Chuban diptych. Robinson S26-7/8. Provenance: B.W. Robinson. Fine impression and colour. Very good condition. 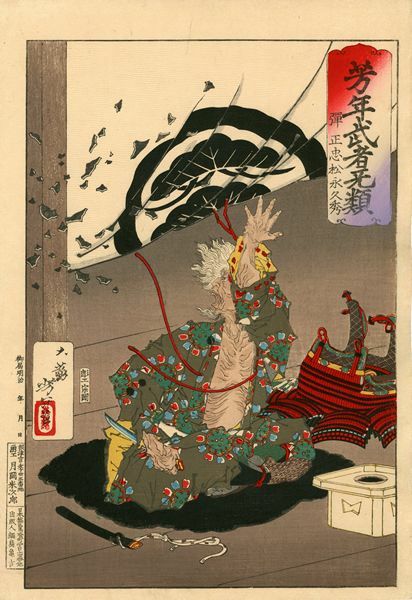 Tsukioka Yoshitoshi (1839-1892)- Kobayakawa Takakage Debating with the Tengu of Mount Hiko. From the series Shingata sanjurokkaisen (New Forms of Thirty-six Ghosts). 1892. Oban. Keyes 509-29, Stevenson 29. Fine impression of the first edition. Fine colour. Very good condition. 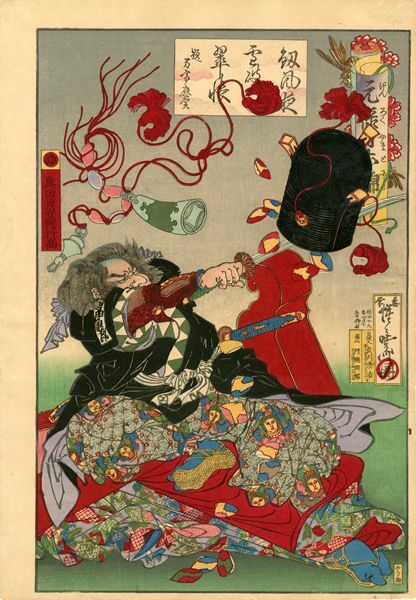 Kawanabe Kyosai (1831-1889)- Okuda Sademon Yukitaka Slashing at a Box for the Shell Game. From the series Genroku yamato nishiki (Japanese Brocades from the Genroku Period). 1886. Oban. Fine impression with extensive burnishing. Fine colour and condition. 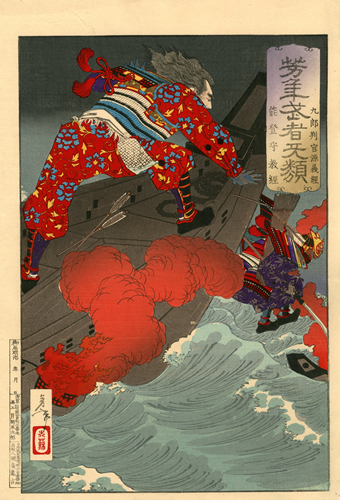 Tsukioka Yoshitoshi (1839-1892)- Hino Kumawakamaru and the Priest Calling Back the Boat. From the series Yoshitoshi mushaburui (Yoshitoshi’s Warriors Trembling with Courage). 1885. Oban. Keyes 460-14. Fine impression and colour. Very good condition. 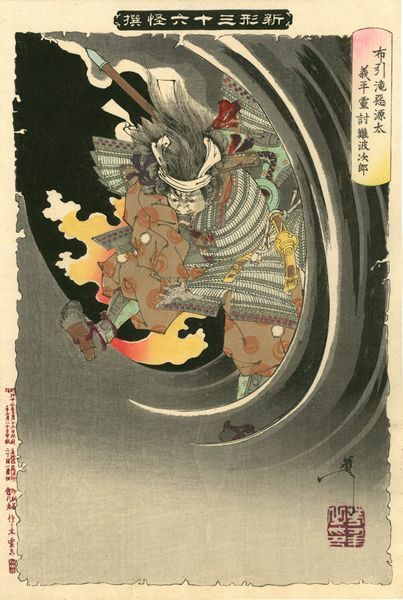 Tsukioka Yoshitoshi (1839-1892)- Kintaro Seizes the Giant Carp (Kintaro rigyo o toru). 1885. Vertical oban diptych. 74 x 27.8 cm. Keyes 473. 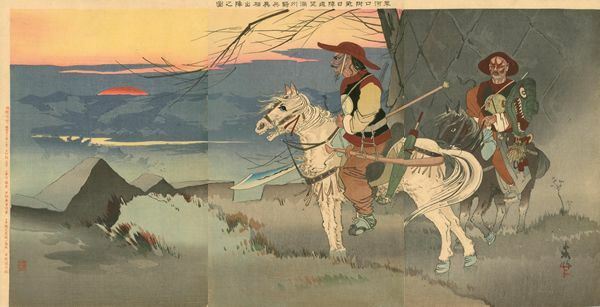 Provenance: Kaburaki Kiyokata (1878-1973), a pupil of Yoshitoshi. Fine, early impression with gum applied to the eyes of Kintaro and the carp. Fine colour and condition. Both sheets joined. Tsukioka Yoshitoshi (1839-1892)- Kon Sosho Facing a Dragon on a Rocky Promontory Over the Sea. From the series Wakan hyaku monogatari (One Hundred Ghost Stories of China and Japan). 1865. Oban. Keyes 134.25. Fine, early impression on deluxe paper with over-printing on the dragon. Fine colour. Slight rubbing in the margins. Very good condition. 1886. Oban. Keyes 460-33. Fine impression, colour and condition. A few printer creases in top margin. 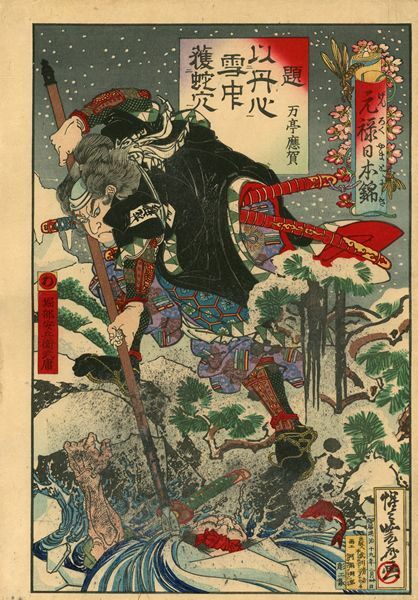 Migita Toshihide (1863-1925)- Minamoto no Tametomo of Herculean Strength Hunting Down His Enemies. An original preparatory drawing for an oban triptych. Circa 1890s. 36.1 x 79.6cm. 1895. Oban triptych. Fine impression, colour and condition. Tamba 267, Philadelphia 40. Circa 1843-4. Oban. Robinson S31-16. Fine impression, colour and condition. Circa 1845-6. Oban. Robinson S37-3. Fine impression, colour and condition. 1865. Oban. Keyes 147-16. Fine impression with strong woodgrain. Fine colour. Very good condition.